Scyther in game: 7,945 Who? Important notice! Pokemon Scyther is a fictional character of humans. Scyther (Japanese: ストライク Strike) is a dual-type Bug/Flying Pokémon introduced in Generation I. It evolves into Scizor when traded holding a Metal Coat. Scyther is a bipedal, insectoid creature. It is primarily green with cream accents between its three body segments. On the back of its somewhat reptilian head are three points, and it has narrow eyes. Its forearms consist of large, white scythes, which it uses for hunting as well as fighting. On its thighs are spikes of fur, and it has three clawed toes on its large feet. Two pairs of cream-colored wings extend from its back. While these wings do allow Scyther to fly, it is rarely seen doing so. The abdomen of a female will be slightly larger than that of the male. Scyther's blade-like forearms are capable of slicing through logs, and become sharper by cutting through hard materials. Using swift movements, it camouflages itself and enhances the effectiveness of its scythes. The anime has shown that wild Scyther form groups. If a challenger Scyther wins a battle against the leader of the Scyther swarm, the original Scyther leader will depart and the challenger will take place as the new leader. 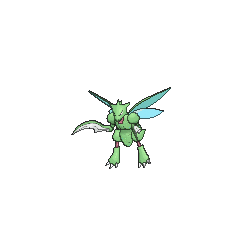 It has also been shown that some Scyther despise the color red, and become aggressive when confronted with this color. Although it is rare, Scyther can be found in grasslands. Tracey caught an elderly Scyther in Tracey Gets Bugged. Even in its old age it is very aggressive, but for the same reasons, Tracey tries not to use it. Scyther first appeared in Showdown at Dark City under the ownership of Yas. It was one of the Pokémon used during the feuds between the Kas and Yas Gyms of Dark City. It is the Yas Gym's primary Pokémon. In Mewtwo Strikes Back, a Scyther owned by Corey was one of the Pokémon that was captured and cloned by Mewtwo. When Team Rocket saw this Pokémon being cloned, it was mistaken for an Alakazam. The Scyther clone was seen again in Mewtwo Returns. A Scyther appeared during the Indigo Plateau Conference in The Fourth Round Rumble, under the ownership of Jeanette Fisher. Ash's Bulbasaur battled the Scyther, and despite the type disadvantage, Bulbasaur came out the winner. It reappeared in a flashback in the following episode and in Bulbasaur... the Ambassador!. 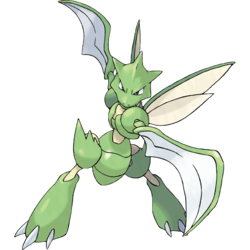 A Scyther has also been used by the Gym Leader of Navel Island, Danny in Navel Maneuvers. It was seen helping Danny's Machoke and Nidoqueen carve Danny's sled and later competed in the sled race alongside Danny's Electrode and Geodude. It reappeared in a flashback in A Way Off Day Off and in another flashback in Hello, Pummelo!. Bugsy used a Scyther against Ash in Gettin' The Bugs Out. This Scyther was trained to block Fire-type attacks by using Swords Dance as a fan. Ash discovered that this defensive strategy doesn't work if a Fire-type move is used from above, which allowed his Cyndaquil to win in his Gym match. A Pokémon Hunter had a Scyther and Houndoom which he had used to chase after Celebi in Celebi: Voice of the Forest. A Scyther was under the ownership of a girl in Tag, We're It! and was partnered with a man's Koffing against Dawn's Piplup and Conway's Slowking. In Pokémon Mystery Dungeon: Explorers of Time & Darkness, Scyther was a member of Team Razor Wind, along with Sandslash and Zangoose. The trio of clawed Pokémon were first seen being blasted out of the Wigglytuff Guild. Team Razor Wind overheard that Team Poképals were assigned with the task of traveling to the Labyrinth Cave to get a Gabite Scale for an ailing Shinx, and decided to attempt beating Team Poképals to the item. Unfortunately for Team Razor Wind, Gabite defeated them easily. It reappeared alongside its team in Pokémon Mystery Dungeon: Explorers of Sky - Beyond Time & Darkness. A pink Scyther appeared in Team Rocket's fantasy in In the Pink. A Scyther was seen in a dojo in Wired for Battle!. A Scyther also appeared in Tricks of the Trade. Casey failed to catch a Scyther in The Bug Stops Here during the Bug-Catching Contest. A Scyther was one of the sick Pokémon in a Pokémon Center in Carrying On!. A Scyther belonging to a Trainer appeared at the Pokémon Jujitsu Academy in Ariados, Amigos. A Scyther was one of the Pokémon defeated by Wings Alexander's then Hoothoot as seen in his flashback in Throwing in the Noctowl. In Extreme Pokémon!, a Trainer with a Scyther was seen practicing and participating in the Extreme Pokémon Race. A Scyther appeared in the opening of Pokémon Heroes: Latios & Latias. 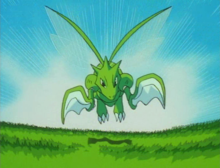 A Scyther was one of the Pokémon that fought in a battle as seen in a flashback in Pop Goes The Sneasel. 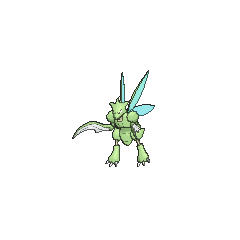 Scyther was used by one of the students of the Pokémon Trainer's School in Gonna Rule The School!. A Scyther was also owned by a demolition crew (which was changed into a construction crew due to Ritchie changing the past) in Celebi and Joy!. Luna from Curbing the Crimson Tide had a Scyther that eventually evolved into a Scizor. EP097 Scyther Ash's Pokédex Scyther, the Mantis Pokémon. Its claws are sharp as swords, and it is a powerful flyer. This Pokémon is rarely seen by humans and almost never captured. EP097 Swords Dance Ash's Pokédex Swords Dance, Scyther's special attack. Scyther spins furiously to focus its energy and increase its attack power. 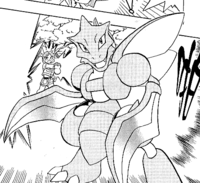 Red used a Scyther in File 4: Charizard in the Pokémon League. A Pokémon hunter owned a Scyther in Celebi: a Timeless Encounter. 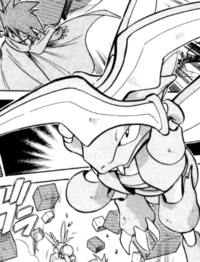 In Pokémon Adventures, Scyther is the first Pokémon Blue received. It has since evolved into Scizor. It first appeared in A Tale of Ninetales. Scyther debuts in Wake Up—You’re Snorlax! owned by a Bug Catcher who partook of the bike race along Route 11. Bugsy is seen with a Scyther in the Gym Leader faceoff. 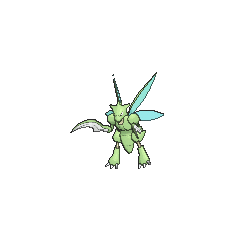 A Scyther is one of the Pokémon sent to help during the fight in Ilex Forest in The Last Battle XIII. A Scyther that was the sparring partner of X's Pinsir, Rute, appears in Scizor Defends, where it is found unconscious by X. Blue indicates that it had its life-force completely drained through mysterious circumstances, but notes that it will eventually recuperate from its condition. As in the games, Bugsy has a Scyther. It is Gold's opponent during his Gym challenge. A Scyther is seen with Red during the curry cooking competition that went on in Curry Showdown! Which is the Most Delicious?. Giovanni is seen with three Scyther in Seize the Dream of One Million Yen!!. All of them are sent out to prevent anyone from winning the contest he hosts on TV. Red is shown to have caught a Scyther in Clefairy Has Been Abandoned?!. One Scyther figure has been released. Pokémon Snap: A Scyther appears at two points on the Beach level. At the first point, the use of a Pester Ball will chase it out. (This also triggers a special Multiple Pikachu Photo opportunity.) The second point is close to the end of the Beach level. Pokémon Stadium 2: Scyther stars in a mini-game alongside Pinsir called "Clear Cut Challenge." Each player chops a falling log for each round of the game. The score for each player is determined by how close the player is to the white line on the log. Cutting anywhere above the log will cause the player to lose points. Pokémon Ranger: Garret uses two Scyther to back up his Scizor. 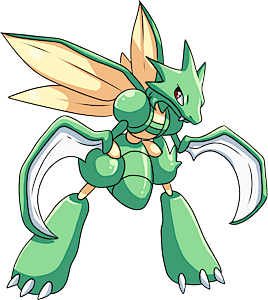 Pokémon Mystery Dungeon: Explorers of Time and Explorers of Darkness: Scyther is one of the members of Team Razor Wind. The same Scyther returns at Super Mystery Dungeon. With ninja-like agility and speed, it can compose the illusion that there is more than one. Leaps out of tall grass and slices prey with its scythes. The movement looks like that of a ninja. Moves incredibly quickly and shreds its enemy with its razor-sharp scythes. On rare occasions, it flies with its wings. It slashes through grass with its sharp scythes, moving too fast for the human eye to track. When it moves, it leaves only a blur. If it hides in grass, its protective colors make it invisible. It's very proud of its speed. It moves so fast that its opponent does not even know what knocked it down. Scyther is blindingly fast. Its blazing speed enhances the effectiveness of the twin scythes on its forearms. This Pokémon's scythes are so effective, they can slice through thick logs in one wicked stroke. Its blindingly fast speed adds to the sharpness of its twin forearm scythes. The scythes can slice through thick logs in one wicked stroke. It tears and shreds prey with its wickedly sharp scythes. It very rarely spreads its wings to fly. It is nearly impossible to parry its attacking scythes. Its movements are like a ninja's. The sharp scythes on its forearms become increasingly sharp by cutting through hard objects. When it moves, it leaves only a blur. If it hides in grass, its protective coloration makes it invisible. It confuses its prey with its quick, ninja-like movements. Then, in an instant, it cleaves them with its scythes. While young, they live together deep in the mountains, training themselves in how to fight with their scythes and move at high speeds. Moves marked with a superscript game abbreviation can only be bred onto Scyther in that game. 51%-100% HP My scythes are honed to ultimate sharpness! 26%-50% HP Careful now. See, my HP's down to half. Level up I leveled! My scythes grew sharper, too! Scyther slashes while hopping about. Its scythes can destroy a Metal Fence. It attacks by slashing with both arms while jumping around. It leaps around quickly while it attacks with cutting slashes. Scyther investigates the Meadow Zone looking for tough Pokémon! His specialty is Bulbasaur's Daring Dash. He says he likes battles and wants to go to the Crag Area. He means it, but he also likes the laid-back atmosphere in the Arbor Area. Attacks do more damage when things are looking desperate. For other sprites and images, please see Scyther images on the Bulbagarden Archives. In the Pokémon Red and Blue beta, Scyther's prototype name was "Stryke". This is a corruption of the word "strike", which is also its romanized Japanese name. 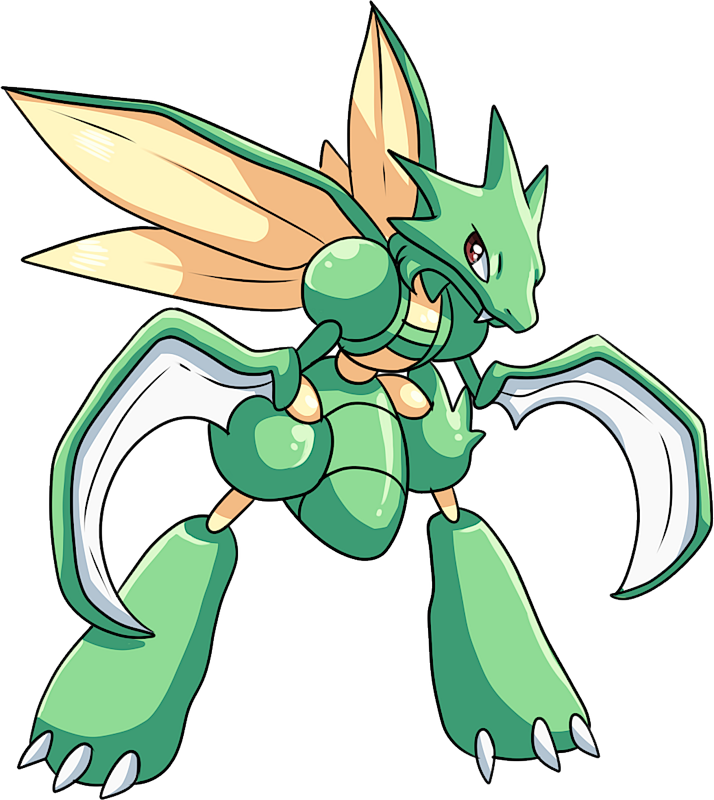 Despite having different base stats, Scyther and its evolution, Scizor, both have a base stat total of 500. This makes Scyther the only pre-evolutionary form that has the same base stat total as its evolution. Scyther can be seen as a parallel to Pinsir. Both of them are Bug-type Generation I Pokémon. Scyther is exclusive to Pokémon Red, FireRed and Diamond, while Pinsir is exclusive to Pokémon Blue, LeafGreen and Pearl. Scyther and Scizor, along with Pinsir, are the only Pokémon legitimately available in all 27 in-game Poké Ball variants. Scyther draws much inspiration from a praying mantis and more likely mantidflies based on its agile mobility. However, its face is more reptilian, with similarities to dinosaurs and dragons. 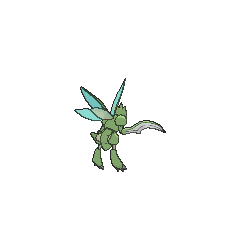 Scyther is a combination of scythe and the suffix -er, in reference to its sharp blades. Cantonese Chinese 飛天螳螂 Fēitīntòhnglòhng Means "Flying mantis"
Mandarin Chinese 飛天螳螂 / 飞天螳螂 Fēitiāntángláng Means "Flying mantis"